Using a VPN for connected devices is the best IoT security you can get. Learn more about Le VPN on routers: the best VPN you can get for connected devices and IoT security. VPN and the Internet of Things. It’s all around us. Everywhere. You can’t escape it. Even if you don’t have a so-called “smart home” it is likely that something you own, something you use is connected. Is Internet ready and sending out signals to the world. Signals about you, signals about your devices, other devices on your network, their IP addresses, your physical address, your business data, your personal data and your family. Sounds scary, right? Well it should. The Internet is a great place, it’s also an avenue for all kinds of mischief to enter your life, some of it annoying and some of it catastrophic. Me, personally, I don’t have too much in the way of smart, connected devices in my home but I do have some… like my baby monitor that conveniently sends me video and sound from my baby’s room across the Internet. Other devices may seem just as innocent but pose just as big a threat. For example, your Wi-Fi enabled printer, the one that allows you to print from your laptop anywhere in the house, is a potential access point for hackers or source of leakage for your data. Think about it, the printer updates itself all the time, doesn’t it? Checking back to the home network to see if there are new updates ready, each time connecting to the internet, broadcasting its and your IP address across the Internet, signaling to hackers, viruses and malware that hey, here is a crack in the security wall you may be able to exploit. Even in the simplest forms IoT is pervasive. We all, or nearly all of us, carry a smart phone in our pocket or bag on a daily basis. This phone is your gateway to the Internet and in many cases the functioning unit that operates things like the baby monitor, the houses heating/AC unit, flood lights and security monitors. Businesses use IoT to connect entire manufacturing lines into a seamless unit. 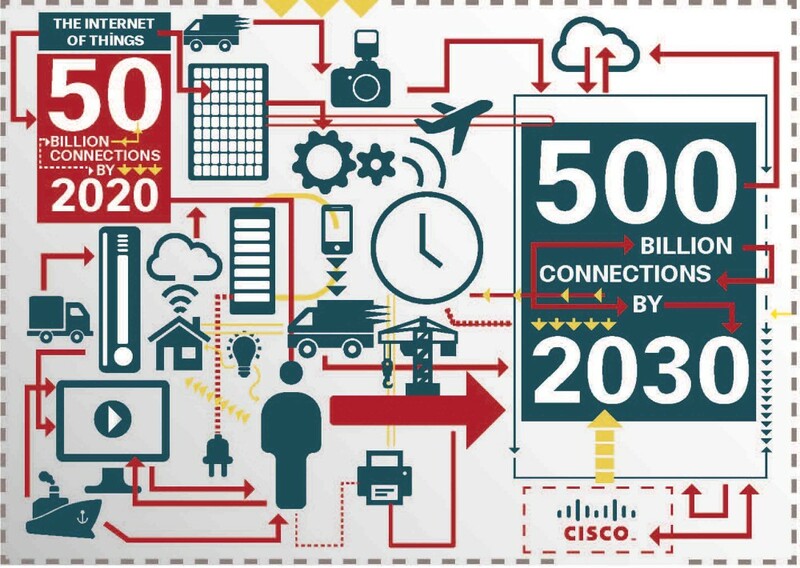 In a more advanced sense IoT has risen to a scary level, a level not too far away from stories told in movies like the Terminator; Skynet is real and it is a near certainty that you are already connected to it. Routers, especially the Wi-Fi enabled routers we all love so much and that the IoT relies on, are particularly vulnerable to attacks, viruses and malware. In fact, new vulnerabilities and attacks are being discovered faster than the old ones can fixed, leaving a gaping hole in any network security plan. In terms of your local IoT, this is the portal through which all your traffic, incoming and outgoing, will flow through. Of particular concern are routers intended for the home or small office where security concerns are not as pressing. What many don’t realize is that it is these very routers, the ones intended for small businesses, that are powering most of the Wi-Fi hot spots found around the world. In this respect the problem is two-fold: the connections made by patrons across the Wi-Fi are vulnerable to hack as well as the routers and devices powering the Wi-Fi network itself. Avoid ISP supplied routers. These routers have often been used previously, they contain support credentials hard-coded into them that cannot be removed and their firmware is rarely updated, if ever. The threat, above and beyond the average, is that one router supplied by a company will become compromised and lead to them all becoming compromised. The best solution is to purchase your own, direct from the manufacturer, to ensure security for your network. One important factor for keeping your routers safe is to be sure they are updated regularly. The routers manufacturer is likely to update the firmware on a regular basis, patching security leaks and enhancing performance, just like any other software driven and Internet connected device. For the user this means logging into the router, checking for and enabling the update, a job the average internet user has no idea even exists, much less how to do. There are services that do it for you though, and even pre-install a VPN connection on your router, like the one provided by Le VPN. Learn more about our VPN router partners. Another simple and yet often undone fix for router security is to change the default password. Default passwords are generated by the manufacturer and are inherently less secure than a unique password you come up with yourself. Now that I have scared you thoroughly lets take a step back and consider how to protect yourself from the security risks present on the Internet and there are ways to do it. The first is to use commonly accepted best practices including Anti-virus and Malware protection, firewalls, avoid sketchy websites, only open email from trusted sources, using hard to crack passwords and secure connections. The next step, and the one that ensures not only the highest level of available security but the highest levels of privacy and anonymity, is to use a VPN for IoT. VPNs have been around for a long time and only recently have become available to the retail sector. They are a combination of security protocols that create a digital tunnel through which your devices can safely connect to the Internet. The connections are hard to track, appearing as a random and anonymous connection passing through your ISP to some undisclosed location, and nearly impossible to target. In addition, all of your data and all the information sent across the connection is encrypted before it leaves your device. This means that even if your connection is targeted, tracked or intercepted whoever receives it won’t be able to read or use it anyway. The benefits of the VPN are vast. Your data is encrypted and safe from prying eyes, your connections are hidden and cannot be targeted by malware or viruses and your IP address is masked (this is because the VPN uses dedicated VPN servers around the world to anonymously route traffic) so no one will know who you are or where you are. 1-year plan, and all you have to do is download the software and connect. The way it works is like this. You connect to a server of your choice, Le VPN has them in over 114 countries, and then the software you downloaded does the rest. Every bit of information sent across the connection is encrypted from within its packet, the packet being the digital equivalent of an envelop, before being sent across the connection and then verified at the destination before decrypting itself. Top providers will allow you to connect a number of devices with one service and that is pretty cool, but also poses a couple of problems. The first is that you have to go to each device and download the software, and then you have to manually connect to the VPN each time you want to use it. This is only a minor irritation if you are talking about only one computer, or one phone, or maybe a computer and a phone, but becomes a real problem when talking about a smart home, smart community or smart business that has dozens, hundreds or thousands of connected devices, all making their own connection to the Internet and all sending and receiving data across it. The second hassle, and one that is more of an obstacle than the first, is that not all devices are capable of having VPN software installed on it. Think about this, many of the small CPUs that drive the sensors and devices of an IoT network only have the capacity to hold the code that makes them function, much less any security software you want to add and rarely, if ever, room for the addition of VPN. 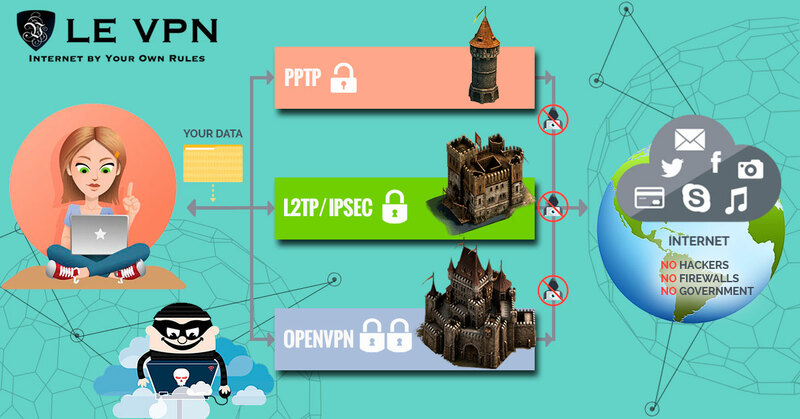 Now, where VPN was the solution to our first problem, the issue of IoT security, there is a solution to this second set of problems, the issue of connecting a lot of devices together using a VPN without the hassle of doing it manually on each device, as well as circumventing the issue of devices that can not have VPN installed on them. That solution is a VPN enabled router. Sounds pretty simple right? It is. A router with VPN or a series of VPN routers set up with the protocols that will best serve your needs is the focal point of all the connections made by your local IoT and the last chance you have to keep it secure; if they want to connect they need to do it through your router so why not use a VPN router? What is a VPN router? I’m glad you asked. It is a router, the device your computer uses to connect with your ISP and to the Internet at large, that is enabled with VPN. This means that all connections made through the router are made using the VPN without having the software installed on them, pretty neat. The biggest advantage to this is that it allows you to connect an unlimited number of devices to the Internet using one single (1) VPN connection. 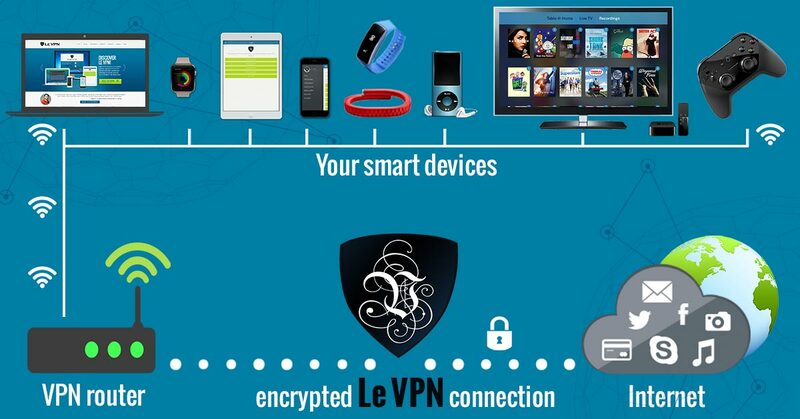 Le VPN has partnered with the major router providers to bring the best VPN router technology to the mass market. Router VPN protocols include Open VPN Router for the highest level of Internet security available as well as those designed for more mundane uses such as general web surfing and streaming media from geo-restricted areas. VPN users have a number of choices when it comes to choosing the right protocol for them. The balance is between performance and security, the higher the level of security of the greater potential impact on the performance of your connections. PPTP – PPTP is point-to-point tunneling protocol. It is the simplest method of implementing VPN router technology but also provides the lowest level of security. In many cases this type of protocol is not encrypted which enhances overall connection speeds and performance. If you are more concerned about general security than you are about the specific loss of data, and higher performance speeds are a must then this is the protocol for you. In terms of security this is a secure protocol. It still encapsulates data and sends it anonymously through the VPN network. The only downside is that it can be blocked by ISPs, so may not be the best choice for unblocking geo-restricted content or evading censors. L2TP – L2TP is layer two tunneling protocol, the next step up from the PPTP. It does not include encryption on its own but IPsec and other security protocols can be used to send encrypted data across the connection. Another improvement over the PPTP is the addition of authentication. All data packets must pass authentication to be opened. The main advantage is that it is the best protocol for bypassing ISP and network level blockages, including geo-restrictions. Disadvantages include slower connection speeds and a growing number of ISPs with the ability to block. Open VPN – OpenVPN is a protocol first written by James Yonan and published under the GNU General Public License. It is an open-source VPN protocol that utilizes SSL/TSL security encryption and peer-to-peer authentication to provide secure connections between multiple or remote devices. It comes with a number of advantages including faster connection speed with higher security and the ability to bypass most firewalls, traffic shaping and ISP restrictions. The major disadvantage is that it is more difficult to set up and is not compatible with most mobile devices. Problems solved by using a router that is already set up with it. Hybrid VPN – HybridVPN is a product offered by Le VPN that combines the security of a PPTP VPN tunnel and a SmartDNS proxy. This combination provides a secure, anonymous connection that is routed through the SmartDNS to automatically unblock geo-restricted media content from around the world. The advantage is that only a portion of the content being streamed is rerouted through the VPN servers, which allows for the fastest connection speeds while maintaining security. One of the most powerful and versatile routers with Le VPN already installed is the ASUS RT- AC68U. This is an ASUS router with dual core processing and 2.4 and 5Ghz access points. The 1900Mbps connection speed and dual band AC make it the optimal choice for gaming or streaming HD media and is available from SABAI Technology. Other key features include modification to run on the SABAI Technology operating system, the ability to run PPTP or OpenVPN protocols, easy to set up only takes 5 minutes, instantly connects non-VPN compliant devices to the VPN network, works with MAC, Linux or Windows and can easily be used with Apple TV, Roku, Xbox, PS3 and other streaming devices. SABAI has always created their devices with the novice in mind and have not failed with this one. Technical support is available for those who need it however, the plug and play quality of the set up make it a near no-brainer. After ease of use the Gateways feature is the most popular feature that SABAI brings to the Le VPN enabled router. Gateways creates a list of all connected devices and allows the network administrator, or anyone with admin access, to manage which devices connect with the VPN and which connect with the local ISP. This may not sound like much but when it comes to download speed and streaming media it is huge; this feature allows you to limit the amount of data flowing across the VPN so that the fastest possible download speeds are achieved. It is very important to note that at face value these routers are the same models offered on other websites. The difference is that the SABAI Technology routers are an aftermarket model with modifications, specifically the SABAI OS, that allows them to run VPN technology or come with Le VPN already installed. It is this modification that makes the router VPN the technological gem that it is, allowing an unlimited number of devices to connect to the Internet through the single VPN connection. Without it these are just routers with the same security and privacy risks as any other router connected to the Internet. It goes without saying that the Internet is full of risks. The Internet is also full of great and good things, information, social media, streaming movies, connecting the world together. The need is safety, the solution is VPN. 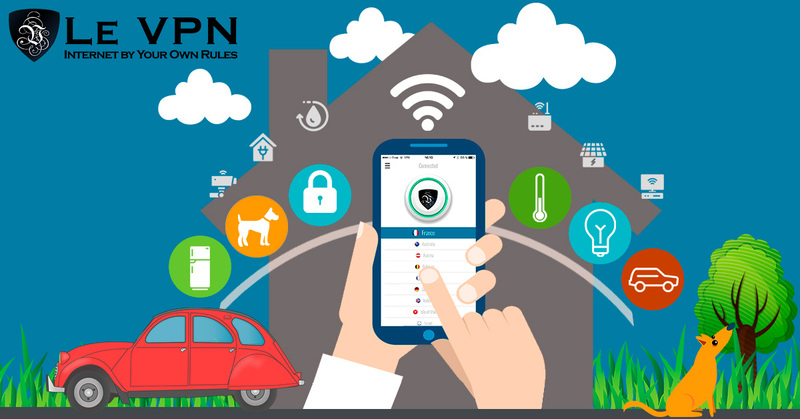 In today’s world of IoT, the Internet of Things, where devices and homes and communities are connected together, VPN routers are the way to go. Why wait, get yours now and enjoy peace of mind along with your HD movies. Can non-vpn routers be used with Le vpn, such as Google WiFi or other mesh-routers?